The interactive and cuddly FurReal Friends Cuddles My Giggly Monkey Pet weighs a little over 3 pounds and acts like a real baby monkey would. The creation from FurReal Friends looks and acts very lifelike, and allows your child to experience pet caring responsibility through the diaper changing, feeding and other care giving actions that must be constantly performed on Cuddles. 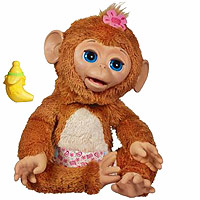 With dozens of responses to your child's actions and voice, this soft and huggable baby monkey doll might be your child's new best friend. Is Cuddles My Giggly Monkey Pet Worth Buying? This lifelike, cuddly toy pet is recommended for ages 4 and up, and is perfect for young children to learn a sense of responsibility. Cuddles rewards your child with a moving mouth when she is fed with her banana shaped bottle, and will giggle and make other laughing sounds when your child tickles or cuddles with her. The doll looks very realistic and acts "alive", even closing her eyes and snoozing when she is rocked to sleep. A sensor inside Cuddles understands when she is held upside down, and she thanks your child with an exclamation of "Whee!" And any time Cuddles is hugged, she hugs back. The FurReal Friends Cuddles My Giggly Monkey Pet is also extremely soft and comfortable feeling, not like some play pets where you can feel the interior components. All of Cuddles' reactions to your child appear very natural, and are driven by special sensors that can be activated through touch, sound and your little one just being nearby. Children love it when they tap her head and she turns to look at them, blowing them a kiss. Battery power is thankfully conserved as Cuddles will go to sleep after a little more than 1 minute of inactivity. At around 8" x 15" x 15" she is a good-sized little bundle. Performing actions similar to other interactive play pets is common among many cuddly toys. Yet the individual moods and gestures which the FurReal Friends Cuddles My Giggly Monkey Pet exhibits are unique, and will be more appealing to girls than boys.